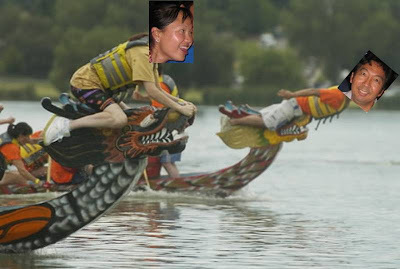 Space Dragons Dragon Boat Racing Team: PORTLAND BOUND! Flag-catching style Dragon Boat Racing! Space Dragons are Portland-bound for the Portland Dragon Boat Race, June 7 & 8, 2008, celebrating its 20th tournament anniversary! Sign-up ASAP (roster space is limited!) via Evite. Please contact Denise, our Portland Tournament Manager, with any logistics/travel questions. Do NOT plan on bringing your paddles. The boats used require a specific (longer) paddle that they will provide. Just bring yourself & your race jersey & bottoms. Race will also provide PFDs, but you may bring your own if you prefer. Hotel is approx 2 blocks from race site. Space Dragons have reserved a block of 10 rooms. Contact Denise to get in one of these rooms. Studio Suites for $169 per night. Each room can sleep up to 4 people. There is a king bed and full size sleeper sofa. Rooms are reserved Fri. - Sun, but if you are staying until Monday that can be arranged (ask Denise). Cost of rooms includes a continental breakfast. For those renting vehicles or driving, cost to park @ hotel is $21 per night. IF AT ALL POSSIBLE, PLEASE PLAN ON ARRIVING & BEING SETTLED INTO THE HOTEL BY 4:00 pm ON FRIDAY. OUR IMPORTANT PRACTICE IS CONFIRMED FOR FRIDAY JUNE 6, 5:00-6:00pm. Hotel has no shuttle service but we can pick up the Blue Star Shuttle from the airport. Cost is $14 per person. No reservations needed. Airport is 12 miles from hotel, approx. 35 minute drive. Optional, not required for the tournament.